Something very important to learn is how to apply the correct line spacing to paragraphs. 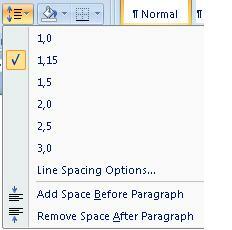 Quite often, homework at university or school requires a specific line spacing, such as 1,5 or 2. Let's see how to do this. 1. Highlight the paragraph we want to change. 3. A window will open up with the available options. As you can see from the image below, it is set to 1,15 at the moment. 4. We will change it to a line spacing of 1,0. To do this, we click on that option. If you notice carefully, our text is closer together than it was on the previous example. 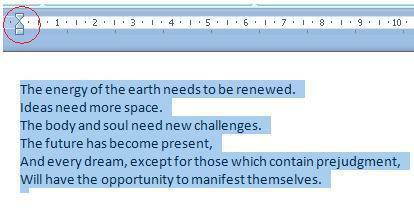 Another option we will be using when editing or writing text in Word is the function of Indent. It is the space from the left margin used to write. For example, if you look at the image below, you will see that the text is right at the beginning of the left margin. It is important to notice the ruler. We saw the text beginning at the start of the left margin in the previous image. In this case, we have increased indent. Notice the ruler again and you will see the change.